In this weeks tutorial we’ll be creating a WordPress widget to display the current weather for a specified location. To do this we’ll be using the great Weather Underground API. You can sign up for a free developer account here, or sign up for a professional account to get increase request rates. Once you’ve signed up and registered for your API key, you should see something like the following. 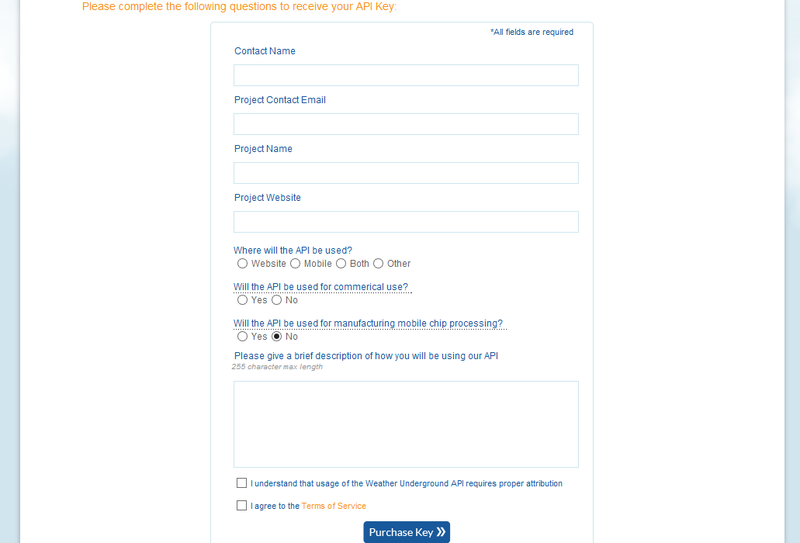 To actually query the API we just need the API key. 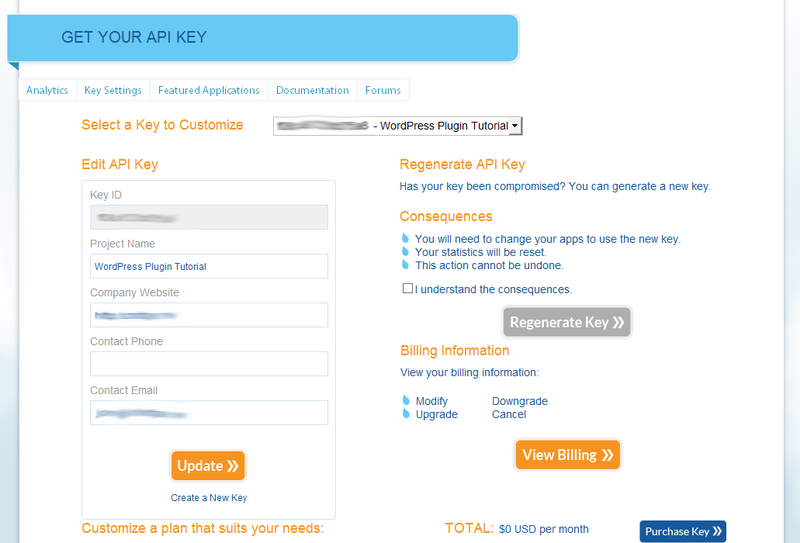 The Wunderground API does not use OAuth to authenticate requests, we just include the key in our request URI. The first thing we need to do is add the WordPress plugin meta comments. This will allow us to activate the widget as a plugin via the Dashboard. If you’re writing a custom theme you can just include the final widget code in your functions.php or call it using require_once or include_once functions. The render method (widget), outputs the widget HTML and performs any work unique to the widget instance. The __construct method simply needs to call the parent WP_Widget __construct method and pass in some basic configuration values. The first is the widget identifier, followed by the widget name and an optional array. The array can be used to specify a description or the default class. To configure the widget we’ll need to be able to save some instance configuration values such as the API key, the location we want to display and the title of the widget. To do this we use the get_field_id (not documented, but it’s there!) and get_field_name functions to help render the input elements. The form method also takes in a $instance parameter. This parameter contains the current configuration values for the widget. The update function is used to save the widget configuration. All we need to do is pull out the new values from the $new_instance parameter and return a cleansed array. We use the strip_tags function to remove any unwanted HTML elements. Now that we have a configured widget we can look at rendering it, this is where the widget function comes in. The widget function takes in 2 parameters the arguments and the instance values. The first thing we need to do is pull out our API key, location and title values. At this point we’re also going to register and enqueue our widget CSS using the wp_register_style and wp_enqueue_style functions. To make the request, we simply pass the URI to the wp_remote_get function and parse out the result body, transforming it in to an object using json_decode. Since we now have our JSON object, we can start parsing it to populate our widget. The current weather is located in the current_observation property. This is where we can pull out the location, temperature, wind speed/direction and the humidity. To style the widget I’ve gone with fairly double common rounded corner feel. You’ll see this in various mobile apps and I think it works quite well. To achieve this you simply set the border radius values for the top right and bottom left corners of the widget. I’ve then specified some colors and specified a large font size for the temperature and a medium size for the location. This gives the widget focus areas that make it easier to read. The full CSS looks like this. 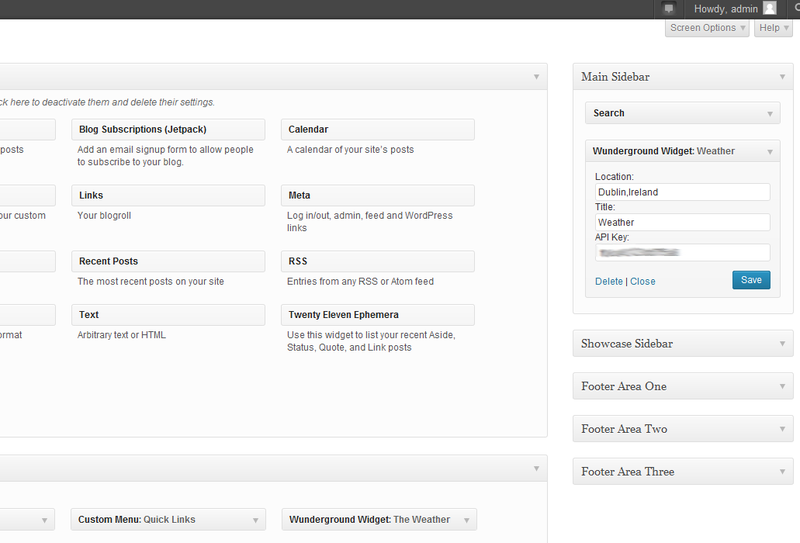 Both the CSS and the wunderground.php code are available in the download below.